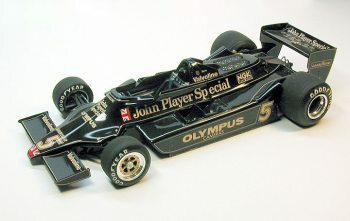 The Tamiya kit allows building two versions: the early version equipped with vertical oil coolers in the left sidepod and the later 79 version where the oil coolers had been rearranged in a similar (tilted) shape like the water radiator. The kit provides the coolers and corresponding fairings for both versions. 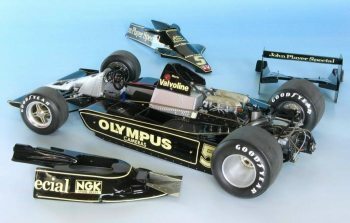 The kit monocoque recreates the chassis numbers 2 to 4 (the first chassis had a different top section in front of the driver) so that it is possible to build all Lotus 79 versions raced from Belgium 1978 towards the end of that season. I decided to build the Belgium version where the Lotus 79 took its maiden victory in the hands of Mario Andretti who went on to win the 78 championship.